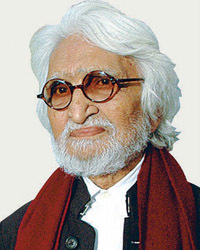 M F Husain (1915-2011) was born in Pandharpur, Maharashtra. A self-taught artist, he came to Mumbai in 1937, determined to become a painter. Husain began his career by painting billboards for feature films and making furniture designs and toys, to earn a living. When took up painting as an art form, however, he returned time and again to his roots, and to themes that blended folk, tribal and mythological art to create vibrantly contemporary, living art forms. In 1948, he was invited by F.N. Souza to join the Progressive Artists’ Group (PAG) a group of artists inspired by the “new” India after the Partition of 1947. Often referred to as the “Picasso of India”, M.F. Husain is the most celebrated and internationally recognized Indian artist of the 20th century. Husain’s association with Art Heritage and the Alkazis goes back several decades. Believing in the interrelation of arts, Alkazi worked with a team of artist friends including M.F. Husain, who would often paint the sets of his plays in Mumbai in the 1950s and 60s. The first show done by Art Heritage in 1977 was a group show, which included the work of MF Husain. Husain’s retrospective titled M.F. Husain: The Modern Artist and Tradition was presented by Art Heritage in 1978. Husain’s rise as a public figure had as much to do with his style and presentation, as it did with his themes. His narrative paintings, executed in a modified Cubist style, can be caustic and funny as well as serious and sombre. His themes –sometimes treated in series – include topics as diverse as M.K. Gandhi, Mother Teresa, the Ramayana and Mahabharata and the British Raj, and motifs of Indian urban and rural life. Early in his painting career, and until his death, he enjoyed depicting the lively and free spirit of horses in many of his works. Husain is primarily known for his paintings, but is also known for his drawings and his work as a filmmaker, printmaker and photographer. His series titles Culture of the Streets, produced in Chennai (then Madras) in the 1980s is a series of unique photographs in which an ancient culture is juxtaposed against a teeming, urban metropolis. The unique treatment of foil on photo paper is evidence of the artist’s experiments with unorthodox techniques. This work was showcased by Art Heritage in the India Art Fair 2015. Husain’s name has become almost synonymous with modern Indian art, for no single artist has popularised Indian art, within the country or internationally, as Husain has done. His endless quest for his cultural roots and a fearlessly open-minded willingness to absorb diverse influences has made M.F. Husain one of the most recognisable and sometimes controversial figures of modern Indian art. In a career that spanned seven decades, Husain also made feature films, such as Through the Eyes of a Painter, in 1967, which was a Golden Bear Award winner at the Berlin Film Festival, and Gajagamini in 2000. The Government of India honoured him with the Padma Shri (1966), the Padma Bhushan (1973) and the Padma Vibhushan(1989) awards. In 1986, he was nominated to the Rajya Sabha.